Birthdays, Christmas, anniversaries, Valentine’s Day and a whole host of other special occasions all call for the exchanging of gifts. It could be your mother, sister, aunt, cousin, neighbour or co-worker who is the recipient, but it doesn’t matter. The rules are the same. Before we get into the whole gift giving experience and the best way to find the perfect gift, let’s investigate what a gift is. Seems a pretty simple question to answer, but in fact there are many different takes on the gift giving scenario. To make things easier we’ll look at the general concensus of opinion. A gift, also known as a present, is something you give to someone without expecting anything in return. It’s possible that at the back of your mind you might be thinking about the gift you’ll receive in return, but this isn’t the main reason for giving a gift. Or at least it shouldn’t be. A gift may be given because there is an element of reciprocity, but a gift should essentially be free. Gifts come in many shapes and sizes, vary considerably in price, and can be given for a number of different reasons. You might want to express your love and friendship for the recipient. You might want to say thank you for a gift you’ve received. It could be a gift to charity. Maybe you’d like to give someone a travel souvenir. The main reason however, seems to be the need to follow a custom for giving gifts on certain occasions or celebrations, such as birthdays, Christmas, anniversaries or Valentine’s Day. As you can see there are lots of times in your life that you’ll be faced with finding a gift for a loved one, family member, neighbour or co-worker. It won’t happen just once, it’ll occur time and time again. When faced with a myriad of events that call for a suitable gift, there are ways you can make your gift giving task much easier. Giving a gift can at times be very stressful, especially when you factor into the equation the frequency of the event. An American online gift company called Lenox recently studied some of the aspects of gift giving and came up with a figure for the number of gifts bought by the average American in the course of one year. Amazingly the number was 47. That’s one gift problem for nearly every week of the year. All you UK readers might be thinking that it’s not that big a figure for UK shoppers, but you might be interested in some more local statistics relating to gift giving in the UK. Take a look at this interesting article we found in the Mail Online – Daily Mail. When you consider the frequency of gift giving occasions, it’s no wonder many people turn up a blank, or get so het up about the qualities of the present they’re giving. Anyway, back to the whole problem of giving someone a gift and finding one that they’ll be proud, happy and even touched to receive. When you’re looking for gifts for her, UK shoppers have it pretty lucky. Not only is there a wealth of stores you can visit, locally or in a larger city, there are also hundreds of online gifts sites touting their wares. You’re going to be facing the dilemma on many occasions in the future so let’s help by sharing four simple rules. Keep them at the front of your mind and your task will be a doddle. It’s important to undertake some research before you start shopping. There are lots of do’s and don’ts when it comes to gift shopping, and it will help to talk to people about their experiences and whether there is any etiquette involved. Knowing what is and isn’t appropriate will help narrow down your choices. You might be able to get a few ideas on the type of presents that have gone down well with the recipient in question, and those that bombed. Finding out a little information upfront will increase your confidence when it comes to buying amazing gifts for her. It’s all to easy to get carried away with gift buying, particularly at Christmas. Before you know it you’ll be considering the need to take out a personal loan, or worse still, charging things to your credit card and paying for your gifts many times over and long into the future. You shouldn’t feel obliged to buy a gift that matches a person’s income either. Just because your friend earns big bucks, it doesn’t mean gifts for her have to cost hundreds of pounds to be special. Yes you can get any number of gifts engraved, printed or monogrammed but that’s not what we mean by personal. 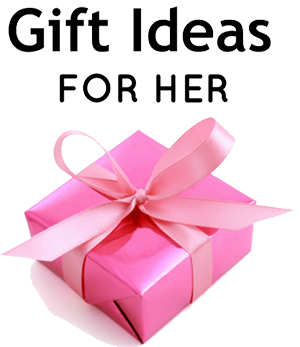 When looking for presents for her, UK ladies would much prefer a gift that relates to a hobby or an activity they like doing. Think about the things a female likes to do in her spare time, and use this to guide you in your quest. Is the lady in question a bit of a photograph fiend? Then perhaps a new camera would be one of the most perfect gifts for her. Is she the sort of person who is very particular about her appearance? This lady might appreciate a pamper session or beauty treatment. If you’ve been lucky to hit the gift giving jackpot previously then don’t fret about trying to find something completely different. If for example, your BFF loved the camera you bought her last year then this year give her some useful accessories. Now you’ve got a few simple rules to follow your gift giving challenge should be a piece of cake. The only thing left is to find the right place to do your gift shopping. What are your options and which are the best? 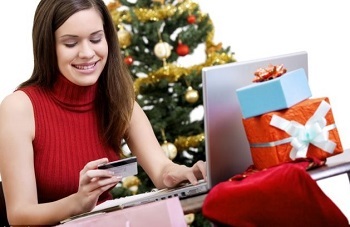 Nobody can deny that online shopping has taken the retail industry by storm. 2012 was a significant milestone, because it was the year that Xmas gift shopping online overtook purchases on the High Street, at least for those shoppers under the age of 55. For ladies and gents over 55 the High Street was still the most popular choice, but possibly not for long. What are the benefits of online gift shopping for her? Choosing to buy gifts for her online has become very popular, particularly amongst those under the age of 60. It’s possibly due to the fact that many modern thinking people are now permanently attached to their phones. It seems that many people can’t make a decision about the simplest of things without consulting the gurus at Google. However, there are other reasons for the popularity of online shopping. To save money – The lack of overheads for an online retailer means they can easily undercut many High Street shops. To save time – We’re all so busy rushing around, working long hours, with daily life so full of commitments that there is little time left for popping to the shops. An online gift site has the advantage that it’s open 24/7. There is a huge variety of gifts – Some of the shops in your area may have a pretty impressive selection, and if you’re prepared to travel to a city then the variety of gifts available becomes even bigger. However, nothing will ever match the diversity, quantity and quality of the gifts you can find online for her. It doesn’t matter what you’re looking for, there are heaps of ideas for all kinds of gifts. There is an excellent choice of niche products – Online gift stores have become a great way for creative people to get their work out there in the marketplace. Many UK artists are using the internet to great advantage, as indeed are artists from all over the world. Take a look at Etsy for example, and you can choose your gift from anywhere across the globe. Family and friends overseas are easier to shop for – Gone are the days of sending cards through the snail mail, or sending a gift and keeping your fingers crossed it will arrive and still be in one piece. Many of the more popular gift sites will safely and securely send your gifts to anywhere in the world. If you’re not already a convert to online gift shopping the benefits we’ve mentioned will certainly make you think twice before heading into town. However, a word of caution. The newspapers are full of horror stories relating to shopping online, so we thought we’d end with some tips for staying safe while shopping for presents online. It’s easy to be worried about the stories you read, concerning hacking and the stealing of personal information. However, nowadays it would be difficult to organise many areas of your life without reverting to using the internet. We’ve already extolled the virtues of purchasing amazing gifts for her online, so we’d be mad not to give you some tips and hints on how to stay safe. You wouldn’t enter a High Street shop if you didn’t recognise it, or it somehow seemed kind of suspicious. It’s no different when shopping for the best gifts for her online. If the site looks a little shady or gives you a bad feeling click off the site immediately. If you think you’re being asked for too much personal information during the registering and check out part of your transaction then quit and leave the site. Many of today’s smartphones are more user-friendly and have better software and an online experience than your desktop, but that doesn’t always mean you’re better protected. Not all mobile phones have the same anti-virus software that you’d expect on your PC at home either. Malware is easier to get onto a mobile device, which means your personal information is at risk of being compromised. You also run the risk of having your mobile device stolen, so make sure it’s password protected. With the right kind of software a hacker can easily steal your information out of the ether, as most wi-fi hotspots don’t encrypt the data. While it might be a little less convenient, wait until you get home to do your purchasing. If you keep a close eye on your bank or credit card balance and transactions you’ll quickly spot a purchase that you didn’t make. If you use a credit card for your purchase then you have added protection, because fraudulent charges must be reimbursed. This isn’t the same if you pay using a debit card, but as long as you spot the mistake the bank will undertake an investigation. Before you type in your card details check that the site is secure. Look for a padlock symbol in the address bar, or anywhere else in your browser window and look for a web address that begins https://. The ‘s’ indicates that the site is secure. Now you’re armed with all the information you need to look for and purchase online presents for her in the UK. We hope we haven’t scared you and that your online gifts for her in the UK go down a positive storm. We’ll be looking at some of the special occasions that warrant the giving of a gift on our other pages, and we hope that you join us for some interesting ideas.